The following classes are offered with any new sewing and/or embroidery machine purchase from Rich's. Call for upcoming dates and times, and sign up today! This 2 hour class will train you on your non-computerized sewing machine. Learn threading, tension, needle positions, buttonholes, blind hem, and stretch and overcast stitches if applicable. Learn the joys of your computer machine. 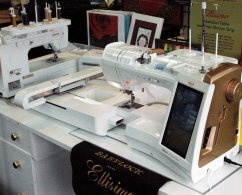 Part 1 will familiarize you with the basic functions of your machine, threading, tension, needle positions, button holes, button sewing, blind hem, stretch and overcast stitches, and help menus. Learn uses of all our included accessory feet and a few more! This is the advanced class for your computer machine. It begins where we left off in part 1, teaching you how to use your machine memories, combining stitches and lettering, using decorative stitches, needles, and threads. This 2-hour class teaches you how to combine embroidery designs, edit, size, mirror, and line up perfectly. Stabilizers, needles, and threads will be taught for perfect results.